WooCommerce Point of Sale System provides store owners to have the functionality, where they can easily manage their online stores along with the physical stores. The physical stores will have a POS front-end management system for which the admin can assign a store agent who can easily manage the sales and customers at that particular store. 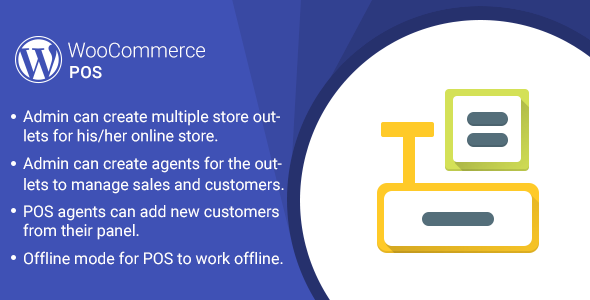 The POS system can work both online and offline with the feature to synchronize all the sales and customer data of the offline store with the online store whenever going online. The module plays a vital role in increasing the day-to-day sales by having a management system to manage online stores along with the physical stores. Admin can create multiple stores outlets for his/her online store. Admin can create agents for the outlets to manage sales and customers at their end. POS agents can add new customers from their panel. Offline mode for physical stores to work offline in case of poor connectivity. POS agent can synchronize the data with the online store whenever going online. Effective sales and inventory management system for the admin. Barcode readers can be used to add products to the cart. Hassle-free payment and checkout system. POS agent can apply a coupon to the cart. POS agent can select the currency for the store. POS agent can hold cart to process it after some time. POS agent can see sales history, hold sales, offline sales from their panel.